New year, new you? So many of us try to start out the new year with healthy eating. Whether it is a resolution or just detoxing from the holiday, it’s a great way to begin the year out right. I’m always trying to figure out ways to make clean, healthy meals that will feed my whole family. Double bonus if it is a one-pot dish. I’ve been mildly obsessed with spaghetti squash this year. Typically I use it in place of spaghetti noodles with meat sauce and my whole family loves it. This week, I decided to take spaghetti squash tex-mex. This dish is delicious and adaptable to what you have in the pantry or the level of heat you prefer. Preheat oven to 375. In large casserole dish, cover bottom with shallow layer of water. Cut squash in half lengthwise and scoop out the seeds. Place upside down in dish. Heat in oven for 45 minutes. While squash is cooking, brown turkey in a large pot on medium high heat. Drain any excess grease. Add green pepper, onion, green chili and green beans. Saute on medium heat until vegetables are softened. Add tomato sauce, salsa, and spices. Simmer on low until spaghetti squash is finished. When spaghetti squash is done, remove from oven. Scrape insides of squash into a deep casserole dish. Spread turkey mixture over top of the dish. Sprinkle cheese on top and place in oven for 25 minutes. 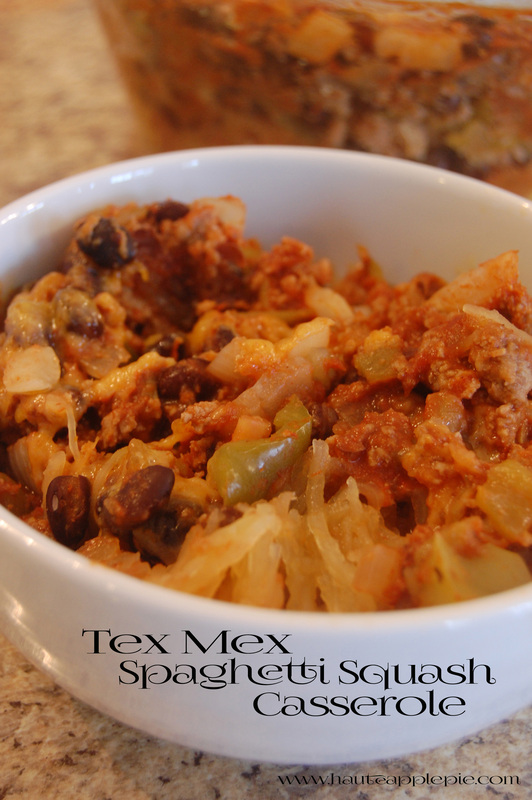 Feel free to add some spicy jalapeños or or kicked-up salsa to make this dish extra spicy! A little queso fresco instead of cheddar is also delicious. It’s Comfort Food Time on the Food Network Dish. 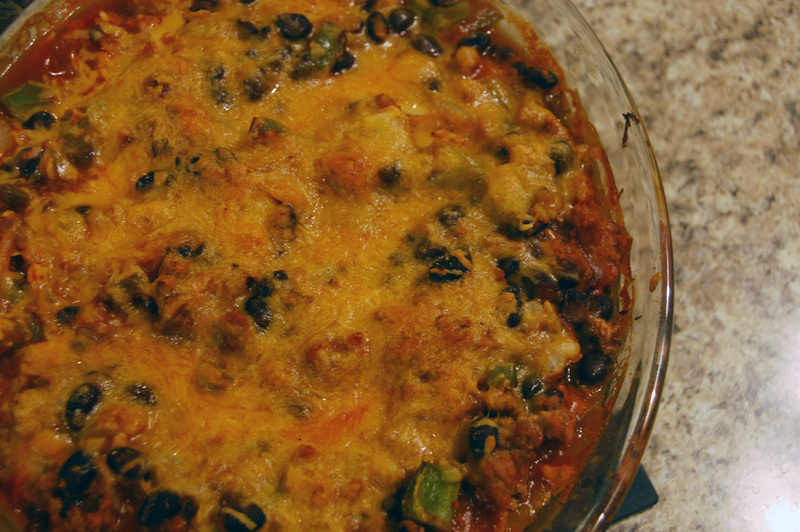 Check out these other awesome casseroles from our friends around the web! Happy New Year to everyone from Haute Apple Pie! I love spaghetti squash and have been making it constantly the past few months. Great recipe! !